Feed your dog's wild side with the Triumph Grain-Free Oven-Baked Chicken, Chickpea, & Blueberry Recipe Biscuit Dog Treats. Made with Real Deboned Chicken and Chickpeas with no corn, wheat, gluten, soy or any artificial colors, flavors, or preservatives. 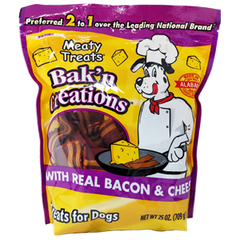 Your dog will love the flavor and crunchy oven-baked texture. They’re made with wholesome ingredients like peas and chickpeas, and superfoods like kale for a natural boost. And they’re perfect for training or anytime your dog deserves a wholesome, grain-free reward. Chicken, Sweet Potatoes, Chickpeas, Chicken Meal, Chicken Fat, Peas, White Potatoes, Blueberries, Dried Kale, Rosemary Extract.